Nicolette Craig speaks to shark biologist Dr Greg Skomal who has recently revealed new information on where Basking sharks go during the winter. Basking sharks are in UK waters in the summer. Where do they go in winter? Basking sharks in the eastern Atlantic remain in temperate waters seemingly throughout the year. There is ample forage for them and water temperatures do not drop too low. By contrast, in North America we see dramatic temperature shifts that force our Basking sharks to move out of these northern areas. We didn’t realise just how far south they went, but by tagging them we discovered that a number of our tagged sharks travelled to the Caribbean and even to South America. The situation is further complicated by the fact that there is mixing between eastern and western sharks. A study last year tracked a shark moving across the Atlantic from the Isle of Man to Newfoundland. So are these of the same population, with individuals acting differently on each side of the Atlantic, or are these two populations with a few individuals crossing? We don’t know...yet. Why did it take so long to find out? We simply did not have the technology before. For most shark species, conventional tag programmes, fisheries data and surveys are used to define species movements and distribution. However, for all these techniques, you need to be able to catch the shark. Basking sharks eat plankton and are not taken by most fishing gears, so these methods don’t work. 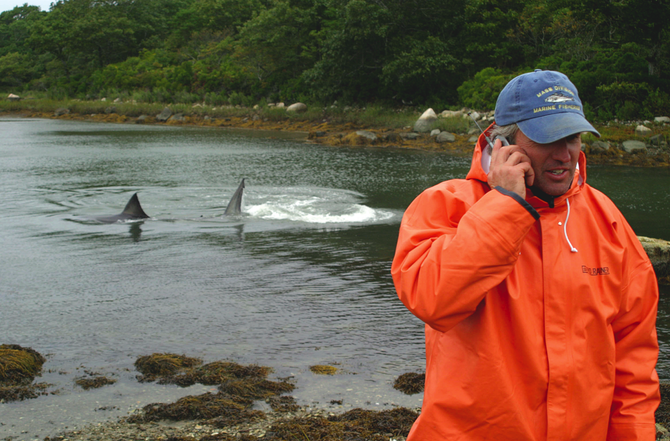 So, to answer these questions we needed a tool that did not require a fishery — and satellite tagging is the tool. How do the tracking tags work? Our tags are called pop-up archival satellite transmitting tags. We placed them on the sharks using a modified harpoon technique. Once deployed, the tag collects temperature, depth and light level data, which it stores. At a pre-arranged time the tag pops off the shark and transmits the data to a satellite which relays the information to me. We can then reconstruct the behaviour of the shark — its movements and habitat preferences. To measure the depths to which the sharks swim, we devised a technique based on water temperature measurements throughout the water column. This method only works if your study animals travel very far, which ours clearly did. What implications do you think this study has for the conservation of basking sharks? In essence, we have shown that tropical waters are not a barrier to Basking shark migration and there is high connectivity between Basking shark populations in the North and South Atlantic. This being the case, the Atlantic population may indeed be smaller than we thought. Given that Basking shark populations are thought to be in tough shape, this warrants more Atlantic-wide conservation. This item first appeared in the September 2009 issue of Practical Fishkeeping magazine. It may not be reproduced without written permission.